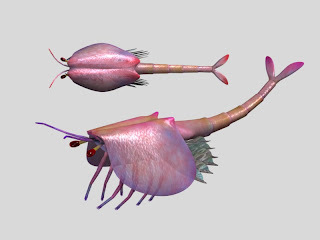 Life Before the Dinosaurs: Waptia. It really does look like a crustacean. Very lobster-ish, don't you think? It looks a lot like a Triops, except it doesn't have three eyes. Some species of Triops can get as big as your hand! And it also kinda looks like a lobster, Mrs. J! Would you eat it dipped in butter? Yah, I'd basically just eat any kind of seafood. I would definitely want to eat a nautiloid or an ammonite. Could I see a scale here? Are we dealing with a lobster or a shrimp here? Waptia was about 3 inches long, so more like a shrimp.